The hut book at Mid King Biv. 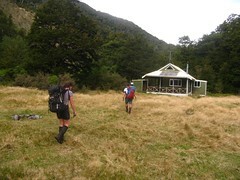 Things began with an idea of a weekend expedition over the Tararua tops to Tarn Ridge Hut. Somehow, even with the weather cooperating for such an idea, things didn’t quite work out that way. 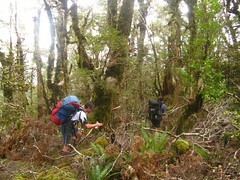 It was the opposite, and we spent the majority of our time navigating off-track below the bush line. Location: Tararua Forest Park, Kiriwhakapapa Road-end. People: Illona, Richard and me. Planned route: Up to Blue Range Hut for Friday night, over to Cow Creek, navigate up to Table Ridge, along around Mitre and Girdlestone, and to Tarn Ridge Hut for Saturday night. Down over Mitre, then up Donald Spur and past Blue Range Hut back down to the road. Actual route: Up to Blue Range Hut for Friday night, over Te Mara and down Donald Spur to Mitre Flats, then up to Mid King Biv for Saturday night. Back to Mitre Flats, up onto Blue Range near Stoney Creek, along to Bruce Hill and down a spur to the south-east to the old bush tram track that leads back to the road. Originally there were going to be four of us, but Paul unfortunately had to drop out with a foot problem, which left Richard, Illona and Myself. We stopped for a Friday night dinner at Carterton, which has a fabulous kebab shop, then continued to the Kiriwhakapapa road-end. Along the way we discussed the original plan, which would have been to walk from Kiriwhakapapa to Cow Creek, up to Table Ridge, along to Girdlestone, and then on to Tarn Ridge Hut… then come down over Mitre and up Donald Spur (a more direct way back to Blue Range Hut) on Sunday. The more we thought about it, the more that this idea seemed to be skimming the edges of available daylight at this time of year. Consequently, we thought we might try doing it in reverse instead, which would make Saturday the longer day. under a blanket of cloud. 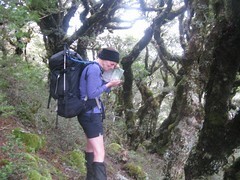 By about a quarter past eight, we’d begun our walk up to Blue Range Hut, eventually to arrive at about 10pm. The solar powered lights are back, which is nice, given they’d vanished last time I visited — perhaps they were just out for maintenance. 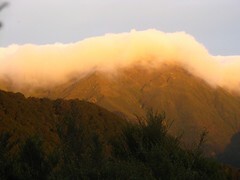 With a long day in mind for Saturday, we were up about 6.30am, and out the door at a quarter past seven to walk past morning views of a sliver of cloud sitting on top of the Tararua Main Range. 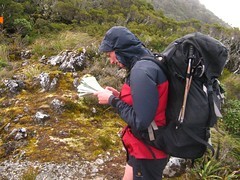 Our 7.15am departure might have allowed enough time for our day’s plan, except that we had more trouble than anticipated in finding the top of Donald Spur — the spur to the north of Donald Stream that heads west of Te Mara (1104), and a known short-cut down to the Waingawa River and Mitre Flats. The informal route up to Te Mara is marked off the main track up from Blue Range Hut with a ribbon tied to a tree branch, but after this we muddled around for some time, and possibly wasted about an hour in confirming we were actually walking down the right thing. Illona near the top of Donald Spur. The delay wasn’t too bad in essence. All three of us have done reasonable amounts of off-track navigation, but none had been in a proper position of responsibility. I think the experience helped to boost everyone’s confidence because we all knew that decisions we made would actually have consequences. We did eventually find the top of Donald Spur, having back-tracked to Te Mara peak, which we’d originally sidled around (trying to be smart). Then we just trusted the bearing to let us sidle up the side, making sure the terrain around us matched what was expected, and eventually confirming with the GPS just to be sure we were correct about our assumptions. Once on Donald Spur things were fairly easy going, although there was more tree-fall than I would have expected given how often I’ve heard it’s used. The tree-fall might be left-over from a storm a year or three back, and maybe not completely cleared out. It was lunch time, about half twelve, as we walked into Mitre Flats. Very coincidentally, within a minute of us walking up, two guys arrived from the direction of the Pines — it turned out to be Adrian and Robert, both of whom we knew. It’s a small country, I guess. They’d camped at Kiriwhakapapa last night (apparently turning up after we left, and they’d seen our car), then driven back to The Pines entrance, and were now on their way to walk to Cow Creek Hut and eventually meet up with the car they’d left at Kiriwhakapapa. As for ourselves, we were beginning to have doubts about whether we still wanted to go all the way up to Tarn Ridge. With a little over four hours of reasonable daylight remaining after we’d finished lunch, standard metrics suggested it could take us about 3.5 hours just for the 1100 metre climb up to Mitre, before carrying on around Girdlestone. The area wasn’t familiar to any of us, and if we were lucky we’d be walking up to Tarn Ridge Hut with torches on the edge of darkness. To add to this, we were having some doubts about the length of time it might take to navigate down to Cow Creek Hut on Sunday, especially if we ran into similar problems as that morning, and once we finally did get down we’d have at least another four hour walk ahead of us. Illona had a rather good idea, though, of going up for a look at Mid King Biv. It hadn’t been obvious at first, because Mitre Flats is one of those areas that’s on the edge of all the maps. Once we were looking at the correct maps, however, and had some time to absorb the idea, it looked feasible and interesting. Mid King Biv is named after Middle King Peak (1521) underneath which it sits. It’s sheltered just below the bush-line and accessible from the tops, but (it turns out) is also very accessible from a spur that leads up from the confluence between Baldy Creek and South Mitre Stream — just south of Mitre Flats Hut. With this in mind, we wrote some notes in the Mitre Flats hut book about our adjusted plans, convinced Adrian and Robert to leave a note on the car after they walked out, and (eventually) Illona would send out a text message to inform our emergency contact. With the new plan, we wouldn’t be able to walk out the original route, either, so we made alternative plans to come back to Mitre Flats the following day, and find another off-track route over Blue Range. 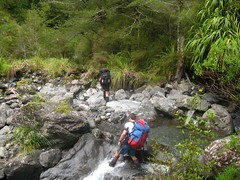 At 1.30pm we began walking straight up the South Mitre Stream, beginning from the small bridge that leads towards Atiwhakatu Hut, but we soon found an easier ground-trail on the true right. After a small (but obvious) creek shown on the map, there’s an informal marker tied to a tree about 5 metres up Baldy Creek from the confluence. Inside the trees, it’s a short hop up a slope, then a cairn. After this, although we continued to have maps and compasses out for most of the climb, things are relatively easy heading up the spur on what is often a well-defined ground trail. We decided it was probably safer to stick with the ground trail when we could, as long as it didn’t suddenly veer away, since it looked as if the contour lines get rather close in a couple of places. 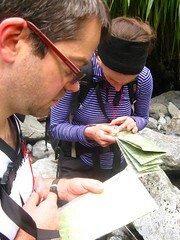 At a high enough point, Illona was able to get out a text message to indicate our adjusted plans. Things gets tangly nearer the height of Mid King Biv, above about 1000 metres. Apparently Mid King Biv was quite difficult to find until very recently, but it’s now quite well marked off the main route along the spur since a couple of years ago. At first we reached a point where we could stick our heads out on the Baldy Creek side of the spur, and noticed a couple of cairns, but they might have indicated an older track or a less common route around that side. After pushing around a lot, Illona spotted one of those giant orange Department of Conservation triangles up ahead, and we found it much easier to reach by going back under the trees and continuing to bash our way through. The triangle primarily indicates where a short, DOC-marked track leads off to the Biv, which is obscured just below the bush line and not very visible from far away. It’s also necessary (or at least sane) to follow this route a short distance to continue going up, since otherwise there’s no obvious way straight ahead. Turning off the spur to Mid King Biv. We reached Mid King Biv at about 4.30pm, and it’s cute. We filled a handy bucket from the stream behind the biv. There’s a good space for camping out front, and a nice fire pit in an area that would be sheltered from the wind coming over the ridge. The biv itself is basically just a box, with 2 mattresses — one of which sits on a platform about 20 cm above the floor. I lifted the lid of the platform to find a scummy old billy, and a few sheets of broken glass that looked as if they might once have been in the small solitary window on the end opposite the door. The hut book’s very cool. It dates back to 1999, and is probably only about 20% full. It looked as if someone might visit every month or two, although some people certainly don’t write in the book. 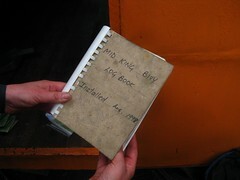 The person who’d come down from here and written in the Mitre Flats book the day before certainly hadn’t. It also makes some of the bureaucracy that surrounds back-country recreation fairly obvious. When a hut is so small and remote, the three required signs that cover DoC’s perceived legal liabilities really stand out. On opening the one and only door of the biv, we were greeted with a proportionally large FIRE EXIT sign, which mostly overlapped the standard DoC “environmental care code” sign to make it look as if the environmental care code ends where the FIRE EXIT is. 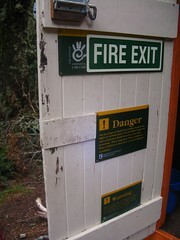 Below the two of them was the giant sign stating “DANGER — Only use your gas stove in ventilated parts of the hut!”, never minding that there aren’t any unless you have your stove running in the middle of the fire exit. Completing the lower section of the door was the regular sign to say “WARNING — the water we provide here is probably okay!”. Incidentally, the water is provided by the Department of Conservation’s well-engineered and very natural looking stream behind the biv that’s a tributary to Baldy Creek down below. All of these signs are spaced on the door of a box in which it’s not possible to stand up straight. The base temperature on Saturday night wasn’t too bad, but there was a lot of wind chill coming over the ridge and down to meet us, which made things uncomfortable when sitting outside to prepare dinner. We spent most of the time wrapped up well to keep off the light but icy breeze. Illona did most of the preparation of Paul’s green curry recipe, which worked nicely, and then produced an interesting dessert based around berries, chocolate, and some weird kind of spongy italian biscuit. Very nice. Nobody felt like camping. Once the dishes were out of the way, we squeezed into the biv, abandoning the second mattress to lean it against the wall. Richard and I head-to-tailed on thermarests on what remained of the floor. We also briefly made more specific plans for getting out on Sunday. Plan 1 would be to cross the Waingawa opposite Mitre Flats, then attempt to get straight onto Blue Range. Plan 2 would be to find a route up to Lookout Point (on Blue Range) which Richard had come down about a week before. 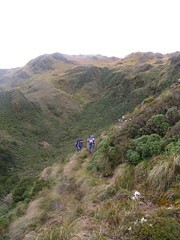 Plan 3, if the first 2 failed, would be to go back up Donald Spur to Te Mara, and down past Blue Range Hut. If we were really in trouble, plan 4 would result in a long and tedious day following the main track out to Cow Creek, then up past Blue Range Hut. As we extinguished our torches and darkness enveloped the interior of the tiny box, I noticed for the first time that those Department of Conservation FIRE EXIT signs glow in the dark! For the entire night, every time I opened my eyes to what might otherwise be total blackness, I could bathe in the warm glow of the FIRE EXIT merely 2 metres from my face. It continued to glow just as clearly at 6am. On Sunday morning, we were once again up at 6.30am, but this time things took a little longer to arrange and we weren’t away until an hour later. Following the initial part of the track that sidles around the main range ridge from the biv and back to the spur, we initially began to follow it upwards by accident towards the main range, but soon noticed our mistake and headed back into the trees to where we’d come. We mostly followed the ground trail to get down, although we probably relied on maps and compasses more frequently than on the way up. The spur broadens in a couple of places which resulted in a few minutes here and there of searching around to find the optimal way down without going too far from our bearing. It was 9.20am when we reached the confluence of South Mitre Stream and Baldy Creek, and 30 minutes later, after some shuffling around on the edge of the stream trying to figure out just how far the ground trail on the true right went, we were back at Mitre Flats Hut to note in the book that we’d passed through again. 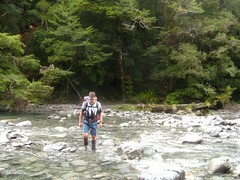 After this we backtracked to the main bridge over the Waingawa, and quickly found our route up to Blue Range. The proper spur that we’d had in mind starts at Stoney Creek and heads a little north of east, but we didn’t follow that far because there’s an informal track that begins from behind a big obvious sign. In one direction the sign points towards Mitre Flats, in the other direction it points towards the road (The Pines). At first glance it seems fairly pointless having this sign at all, given that it only offers a backwards and forwards option, and most people probably want to go to wherever they didn’t come from. On closer inspection, it probably exists because directly behind the sign, a third informal ground trail climbs the hill and it stands out very well. I think this is what remains of the track to the old Mitre Flats bridge, which was further along the river, and we even saw an old orange marker some way along it. Apparently there’s also an unmaintained and rougher track along the river, so there may be some connection. In any case, we followed this ground trail for a few minutes looking for an obvious route up the hill, based on vague memories I had of doing something similar about three years ago. The trail mostly runs parallel above the river, but we spotted a few options for heading up-wards and soon decided on one roughly opposite the hut, just north of the top of a slip, at least as we discerned later once we’d figured out what spur we were on. This took us up a small bubble of a spur heading south-east, almost at right angles to the main spur, and briefly well defined at about the 500 metre contour. There was even an occasional axe-blaze chunk taken out of the odd tree, and we figured that as we couldn’t possibly go past the initially planned spur (one would think) we may as well follow it, and they eventually met nearer the top. After a brief sit-down followed by a little extra climbing, we found ourselves on the southern-most of the two nearby spot-heights at 865 metres. It was nice to be on Blue Range. 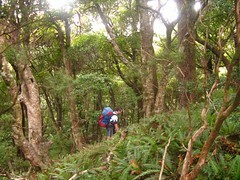 The main Blue Range ridge has a ground trail along much of it which, if you don’t mind sharp Totara branches regularly slapping you in the knees, and occasionally face, is superior in many ways to some of the more official tracks around the Tararuas. (The one I mentioned earlier near Mitre Flats comes to mind.) We pushed north along the range towards Bruce Hill (975), taking guesses every so often at where we were, and confirming with the GPS once we’d placed our bets. The range veers to the north-east as it nears Lookout Point (725), which we didn’t visit because it’s off to one side but which is reportedly not a very impressive lookout point, but is the top of another common route down to the Waingawa River. Very soon after Lookout Point, the going became much tougher and more overgrown. It was still very doable and there’s still a ground trail, but things were certainly slower. After a kilometre of bashing and climbing, we arrived at a small plateau just south of Bruce Hill to stop for a snack, maybe ten minutes before 1pm. From here we’d had an approximate idea to navigate down a wonky spur to the east, then south-east, into Mikimiki Stream, and I hopped up to the top of Bruce Hill, about 100 metres north, to calibrate the altimeter. We debated for a little while about exactly where to go to find our east-ward spur. I managed to confuse myself because there’s a very well defined, and marked, ground trail that heads south-east off the plateau, which I thought might twist eastwards soon after it left. I think Illona had it most correct when she suggested we’d need to simply push eastwards off the plateau and follow a bearing, even though it wasn’t very well defined at a first impression. In the end, we looked at the time of day and considered there were only a few hours of daylight remaining, and followed the markers, leaving at about 1.10pm or thereabouts. It quickly became obvious that the markers were leading us straight south-west down a spur towards spot-height 535 and onto the same old tram-line track we’d have been aiming for anyway, albeit a few kilometres further from our destination. We knew from past ventures, however, that the tram track was very fast, and figured we may as well just hit it further back, possibly adding half an hour or an hour to what we might have otherwise had to walk out. It’s actually a really well defined and easy to walk hunters’ trail down that spur. It’s marked frequently with blue milk bottle caps and white plastic covered in reflective tape, and even hops out onto rocky knolls between the dracophyllum for short stints, affording some nice views of the surroundings both out towards the Wairarapa, and in towards the Main Range. Overall it’s far superior in quality to many official tracks, and we hit the main track a little before 3pm. Not too long after, about 4.15pm or so, we stepped back out to Kiriwhakapapa Shelter where we’d left the car. What a great weekend. 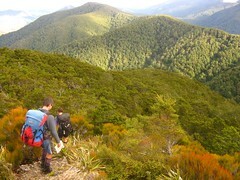 As places go, the Blue Range in the Tararuas isn’t a bad place to get lost. There’s not a lot to fall off, there are plenty of spurs going to interesting places, and it’s on the side of the range more sheltered from the rain coming off the sea to the west, which among other things makes it just a little easier to push through the bush, and probably to find a reasonable campsite if necessary. It’s strange that our initial plan had involved little if any navigation, because I think this is perhaps one of the most worthwhile navigation trips I’ve had so far. All three of us had done some off-track stuff in the past, but none of us was too confident beforehand. Realising that we were all about equal with navigation skills, I think, helped us all to take the responsibility more seriously and it was a good confidence booster. As Illona pointed out, we each tended to look at similar problems in different ways, and it helped to learn from each other without immediately having to feel as if one person was more of an expert and authoritative over anyone else. I’m hoping I have an opportunity to get out on a similar trip again some time. 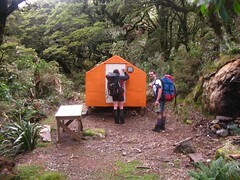 This entry was posted in tramping and tagged bagged:blue range hut, bagged:mid king biv, bagged:mitre flats hut, change of plans, department of conservation, navigation, tararuas, tramping, wellington tramping and mountaineering club. Bookmark the permalink. Hi Mike, hey good to read about your trip and give me some good ideas for future adventures! The walk up to Cow creek is nice from Mitre Flats and with the weather being so good all the rivers and streams were way down. Hi Adrien. What a weird coincidence running into you. Just timing I guess, hehe. Cow Creek seems like a nice place though I’ve only walked past it. Did you walk up the river at all in the end?